Any serious lemon lovers out there would have baked or eaten a lemon bar once in their lives. Add a little sunshine in your kitchen today by baking these all natural lemon bars. Bake, share(lemon bars and God's word) and let the sun and son(Jesus) shines. Watch them eat(lemon bars and God's word) and you will feel blessed you have shared. These are good for the body(vitamins only) and soul(God's word). 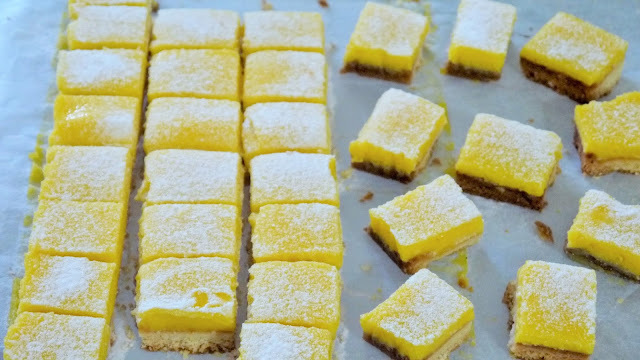 Pardon the uneven slices, I was in a hurry to cut and photograph before rushing out to share these lemon bars with friends. All liked them very much. The base is specially delicious with the added almond meal. The crunchy texture contrast with the lusciously soft curd. I would not describe the curd as sour but zingy and zesty. Heat the oven to 350F with a rack in the middle position. Line an 8"x 8" baking dish with parchment, letting the excess parchment hang over the sides of the pan. First, prepared the shortbread crust. Beat together the butter and powdered sugar in a stand mixer on medium high speed until they are completely combined, turn pale yellow, and resemble creamy frosting.Stop the mixer and scrape down the sides of the bowl as needed while mixing. Add the flour, almond flour, and salt to the bowl. Beat on low speed just until all the flour is incorporated and the mixture comes together into a dough. The dough will seem fairly crumbly,but should hold together when squished in your hand. Press the dough into the baking dish.Use the bottom of a cup to make sure the layer is as compacted as possible and in an even layer. Prick with a fork all over. Bake for 20 to 25 minutes, until the edges of the shortbread turn golden brown. While the shortbread crust is baking, prepare the lemon curd. Whisk together the eggs, yolks, and sugar in a small saucepan, then whisk in the lemon zest, lemon juice, and salt to form a smooth, liquidy mixture. Set a small strainer over a mixing bowl and place next to the stove. Place the pan with the lemon mixture over medium heat. Stir, gently but continuously, until the mixture thickens enough to coat the back of a spoon and registers about 155F on an instant read thermometer. This should take 8-10 minutes. Be sure to scrape the bottom and edges of the pan as your stir. If you notice the mixture starting to coagulate and clump up, immediately remove the pan from heat. Strain the lemon curd into the bowl, removing the zest and any clumps from the curd. While the curd is still warm, stir in the butter.Stir until the butter is completely melted. When the shortbread crust is ready, remove it from the oven and pour the curd over top. Bake at 350 F until the edges of the curd are set, but the middle is still jiggly, 10 to 15 minutes. Cool completely on the counter, and then cover and refrigerate for at least 4 hours or overnight. They looked so lovely and bet you have had a wonderful time sharing these yummy Heavenly Lemon Bars with your friends. Lian, these look so good! Believe it or not, I have never had a lemon bar! I have, though, had lemon meringue pie, lemon curd and lemon juice. Thank you so much for sharing this! 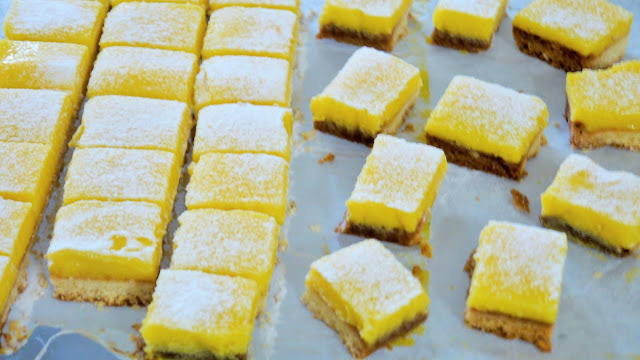 Your lemon bars looks deliciously good! 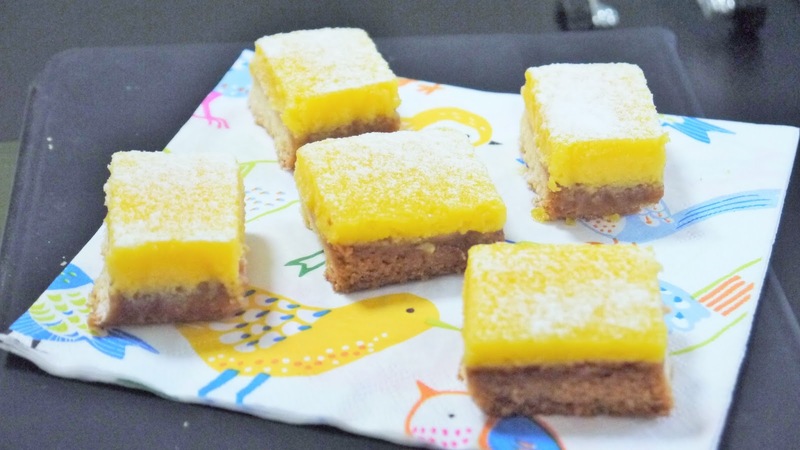 Love the lemony sunny colour and sounds good with the almond crust! 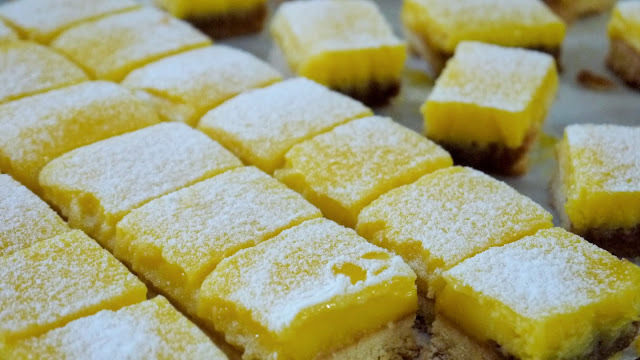 hello lian, im sure you and your friends feel wonderful that you've shared these beautiful lemon bars with them. nice idea for added almond meal into the crust! I missed the chance to join Bake Along so I am going to drool on yours.